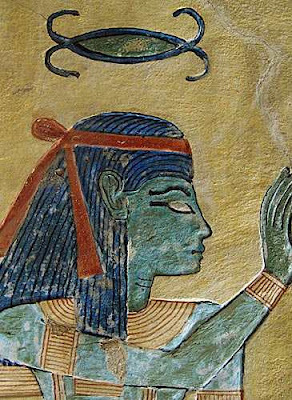 One of Ancient Egyptâ€™s oldest goddesses was Neith (Nit), the matron of Sais. When her city became the capital of Egypt in the twenty sixth Dynasty, her importance in Egyptian spirituality increased. Neith was primarily a warrior goddess, whose symbol was a shield with two crossed arrows, but she had a dual nature. As a goddess of war, Neith was fierce, and she was believed to march into battle ahead of the soldiers. She was said to be a consort of Set, and with him she gave birth to the crocodile god Sobek. In some myths, she is also responsible for the creation of the chaos serpent Apep by spitting into the waters of Nun. In balance with her fearsome side, Neith was also a goddess of the home, and eventually become known as the mother of all gods. She is credited with the invention of weaving, and thus associated with both domestic arts and mummification. Her gentle side was responsible for protecting and offering nourishment to the spirits of the deceased, and she was the guardian of one of the Sons of Horus, Duamutef. 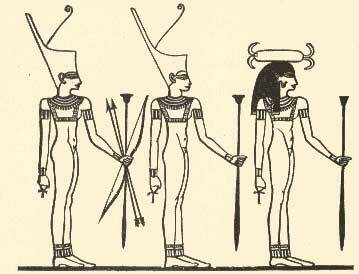 Neith was usually depicted as a woman holding a scepter and ankh, or bow and two arrows. Like other mother goddesses, she was sometimes portrayed as a cow - Neithâ€™s cow form featured an ankh pendant and 18 stars on her flank. Thank you for visiting The Sage's Cupboard: artisan jewelry, proudly metal-free and earth friendly! I'm always ready to answer any questions you may have.